The Ceramics Open Studio is geared toward ceramicists that are at or above an intermediate level or have taken at least two ceramics classes at ACE. 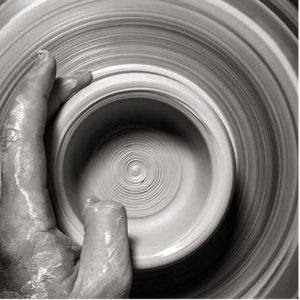 Come to hone your pottery skills or use the studio time to add to your inventory. The open studio is also a great opportunity to meet and socialize with other working ceramicists! 1-4pm pm Please enter through Penn Ave door. 6-8pm please enter through 5th Street door. Teaching Artist Bio: Connie Sherrard has a Bachelor’s of Art in Studio Art from Beloit College, Wisconsin which is where she was first introduced to throwing clay on the wheel. Her professional career has been in Human Services; however, she keeps coming back to ceramics because throwing pots is what she loves to do. Teaching Artist Bio: Trevor L. Durr was raised in Halfway, Oregon. He received his Bachelor of Science in Art from Eastern Oregon University in 2014. Trevor currently works as a Wildland Firefighter during the summer months and a potter and instructor during his off season from fire.